Universal Spirit is talking to us. It is trying to get our attention. It is trying to guide us, connect with us, and wake us up. There are plenty of signs out there but are we looking? Are we listening? And do we even know what to look for? How many times do you wish you had a sign for what direction you should take in life? How many times did you ask for an answer but didn’t know how to receive it? How often do you feel alone and unsupported in life? When you are tuned in to how the universe is communicating with you, life becomes a lot less confusing, and you start to feel a lot more aligned and connected. (Note: I use the terms Universal Spirit, Universal Truth, Universe, Source, Divine, Spirit, Love, Life, God synonymously). However, since we live in a physical world, we also experience physical limitations. These physical limitations don’t exactly allow for Spirit to tap you on the shoulder and say “yes, I think you should take that job,” therefore, we have to pay attention to the more subtle and creative ways Spirit uses to send us messages. The key is to SLOW DOWN, as in overall just live life at a slower pace, and BE AS PRESENT AS POSSIBLE so that you can tune into whatever sign shows up in your life. If you’re stuck in your head worrying, overthinking, overanalyzing, rushing and being busy, judging and being angry, you’re never going to realize when Spirit is trying to get your attention. You have to be present, open, and willing to receive answers. Every sign that I ever get I consider a miracle because it’s a direct connection with Source. I know that when I see a sign, Source is right there communicating with me, guiding me, and I know I am surrounded by pure Love. This is indeed a very miraculous experience. The thing is however, that these miracles aren’t as you’d imagine or how the movies depict them. There are no angels falling from the sky (at least not literally and physically), and there isn’t a face in the sky talking to you and giving you guidance. The signs are less ethereal and are sort of incorporated into the structures and routines of everyday life. The signs are subtle, indirect, and can be very gentle and quiet, although sometimes pretty loud and obvious too. Universal Spirit isn’t out there somewhere, it’s in everything and everyone; all around us, and therefore is intertwined in the ordinary moments of life. This means you can get a sign in the shower, while you’re washing dishes, arguing with your partner, or stuck in traffic. The moment doesn’t have to be glamorous for there to be a sign, but seeing a sign in these unglamorous moments will surely make the moment more glamorous. Also, each sign that comes to you has a message that is unique to you and to your specific situation, and you see signs at the place and time that you’re meant to see them. Because of this, signs are not a “one size fits all” deal, and therefore you have to interpret them on an intuitive level and from a more conscious perspective. It’s essential that you take your ego and fears out of the way and let your intuition guide you. 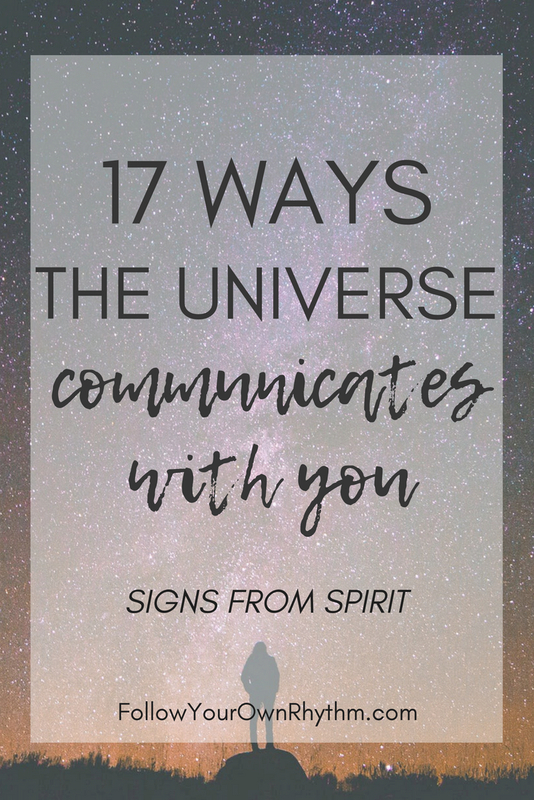 With all of that said, let’s go over some ways in which Universal Spirit communicates with us! Universal Spirit comes to us in the form of people. Don’t ask me how this happens, but the universe has a way of using people as vehicles to carry out certain messages. This can be through meeting a random person who perhaps tells you something or offers you an opportunity, getting a text or phone call from someone, hearing a message on the radio, or overhearing a conversation. Obviously not everything you hear is a sign, but it IS a sign when you are specifically looking for an answer that gets answered by someone randomly telling you something that relates to your question. You will intuitively feel that this is way too random for it not to be a sign from the universe. The key then is to actually FOLLOW it. For example, if you are contemplating keeping or leaving your current job where you are being offered a promotion and you’re panicking and freaking out because you have to decide within a short period of time, and then suddenly out of nowhere you get a text message from one of your coworkers saying “I hate this job, they totally screwed me, they lied about my raise,” then I would say that that was the universe coming through this person to tell you to leave the job. This is actually a true story of something that just recently happened to my husband and I. It really was miraculous. A synchronicity is a random occurrence of events that seem coincidental, serendipitous, and related, yet are not connected by any one thing. For example, you are driving to work and see a child with a red balloon, then you get to work and someone got your coworker red balloons for her birthday, then as you drive home you see another red balloon on an “open house” sign. Coincidence? I think not. Synchronicities are one of the most powerful ways that the universe communicates with you and you start experiencing them more and more the more you start to awaken. And sometimes you don’t even have to read deep into the synchronicity, it’s just a matter of recognizing that there is something WAY BIGGER happening behind the scenes; something way more profound than we can ever imagine. Synchronicities are a direct connection to Spirit and a sign that you are on the right path. Seeing a certain pattern or sequence of numbers such as on license plates, or coming across the same number or number pattern such as in an address or phone number, or seeing the time 11:11, 2:22, 3:33, 12:34, etc., can all have hidden meanings. For instance, if you’re seeing repeating numbers such as 1111, 333, 444, 555, etc. those are all signs from the universe that you’re on the right path. Each number sequence can also have more specific meanings if you analyze what the numbers mean in numerology. You can also see random numbers that mean something special to you like your favorite number, lucky number or your birthday. For example, I always see 6:21 on the clock as my birthday is June 21st, and I always see my husband’s birthday 10:11 (October 11th). These are always signs to me that I am connected to Universal Spirit and that I'm soulfully connected to my husband. Have you ever noticed a random song pop into your head? Or a certain song come on the radio? Or overhearing a certain set of lyrics from some else’s radio? Or hearing someone who passes by you singing a song? When these things are random and you feel a strong connection to the song you hear, it's probably something you should explore further. Pay attention to the specific lyrics that you hear as there can be a message in there for you. If it’s a familiar song such as your wedding song, or a song that reminds you of a vacation, or a song that you used to like in high school, then interpret the meaning of the sign from that perspective. You may have a thought pop into your head out of nowhere. This can be a random idea, a solution to a problem, or something you feel inspired to do. Definitely pay attention to this and see what it can mean for you. For example, if the random thought pops into your head "I wonder how my brother is doing," that is probably a sign that you should call your brother as he probably needs your love and support right now. A sign can be a literal sign with words or pictures on it like a road sign, billboard, or Instagram post trying to tell you a message. For example, if you’ve been in a really dark place lately and you see a post on Instagram saying “the darkest hour is just before dawn,” I would definitely take that as a sign to trust that everything’s going to be better soon. Or if you see a billboard with a palm tree on it saying “it’s time for a vacation” right after contemplating whether or not you should take a break from work, I would take that as a sign to take a break. Or maybe you see a road sign that says “slow down” and for some reason it really resonates with you, that can be a sign that you need to slow down in life and be more present. Again, there are so many different ways you can interpret signs, the key is to follow your gut and not overthink it. Messages, guidance, and answers can come to us through our dreams. Did you have an intense dream that felt super real? Who did you meet? What did they say? What happened? How did you feel? What insights did you gain? Do you keep having the same dreams over and over again? What are they about? Are you seeing the same person all the time, visiting the same places, having the same types of experiences? Look into the “meaning of dreams” to see what it can mean. Do you keep having nightmares? What are they about? Maybe it’s based in a deeper fear that you have that needs to be healed. Do you often dream about a certain time in your life or being with certain people from your past? What does this mean for you? Is there an unresolved issue there that needs to be addressed? Colors, flowers, animals, feathers, rocks, and crystals all have certain meanings. Pay attention to what you see, what you come into contact with, what keeps reappearing in your life, and what you’re drawn to. For example, hawks represent increased spiritual awareness and a time to fly high, the color red represents security, stability and good fortune, and a feather falling on your lap is a "hello" from the universe and a sign that your angels are near. When you feel like “this is right” or “something is off” or “every part of me wants to do this,” that’s a clear sign from the universe. Also, when you hear a message or read something in a book that deeply resonates with you and you don’t know why but it feels right and it feels true, that is your inner truth being awakened. 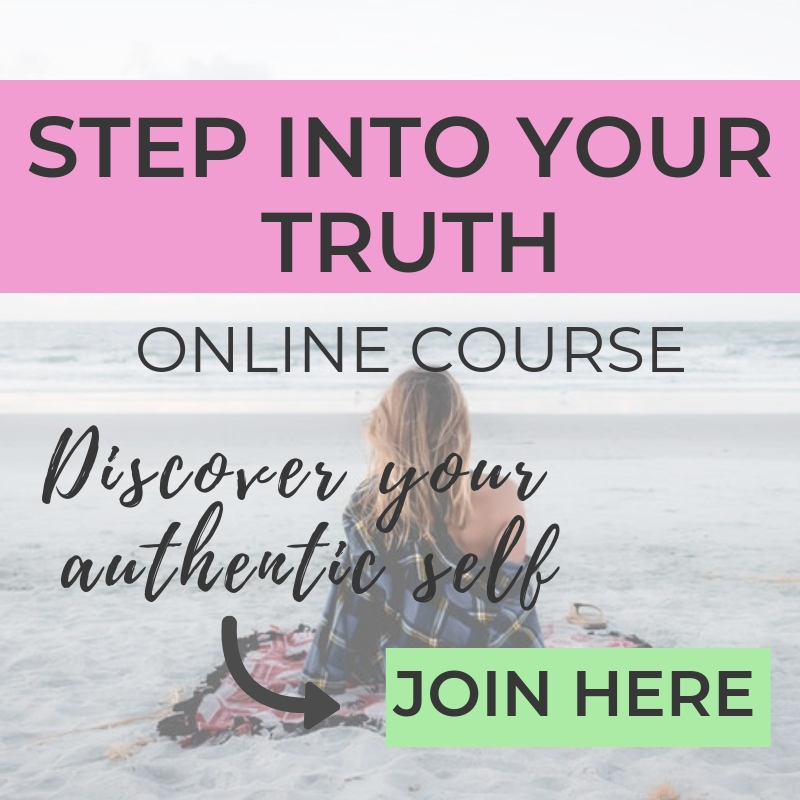 There is a deep truth within us that is connected to Universal Truth, and when you hear this Truth, it starts to awaken something deep within you which makes you feel really attracted to it. Pay attention to this and follow it! The universe can communicate with you through objects such as when you find something you’ve been looking for, when objects fall off shelves or out of cabinets, or when you come across an object that triggers something from the past, supports a new idea you have, or acts as an answer to a question. For example, someone gives you a book on financial freedom just as you decide to get out of debt. Or you’re taking a walk in nature and you see a random baby toy on the ground. Or you find a picture of your sister who you haven't talked to for years. Or a random book falls off of a bookshelf at the bookstore. These are all ways that Spirit is trying to tell you something, it's up to you to figure out what. Maybe your internet goes out, there’s no service or Wi-Fi, your text message doesn’t want to send, your computer shuts off, your movie won’t load, or your TV isn’t working. These signs could be interpreted in different ways. For example, if you have no service but want to send an email, perhaps it's the universe's way of telling you it's not the right time to be working and that you should be enjoying the present moment. When a text message doesn’t want to send, maybe it’s a sign that you shouldn’t send the message or that you should rethink/reword what you wrote. If your TV isn't working, maybe it's a sign you watch too much TV. Physical pain, symptoms, ailments, and diseases are all ways that the universe communicates to you that there is something wrong. Your lifestyle and habits can be causing a problem such as pain in your back from sitting too much. This can be a sign that you need to change your lifestyle and start being more active. However, illnesses can also have spiritual causes that manifest as physical ailments. For example, you can develop a rash from “itching to get out” of a situation or relationship you don’t enjoy being in. 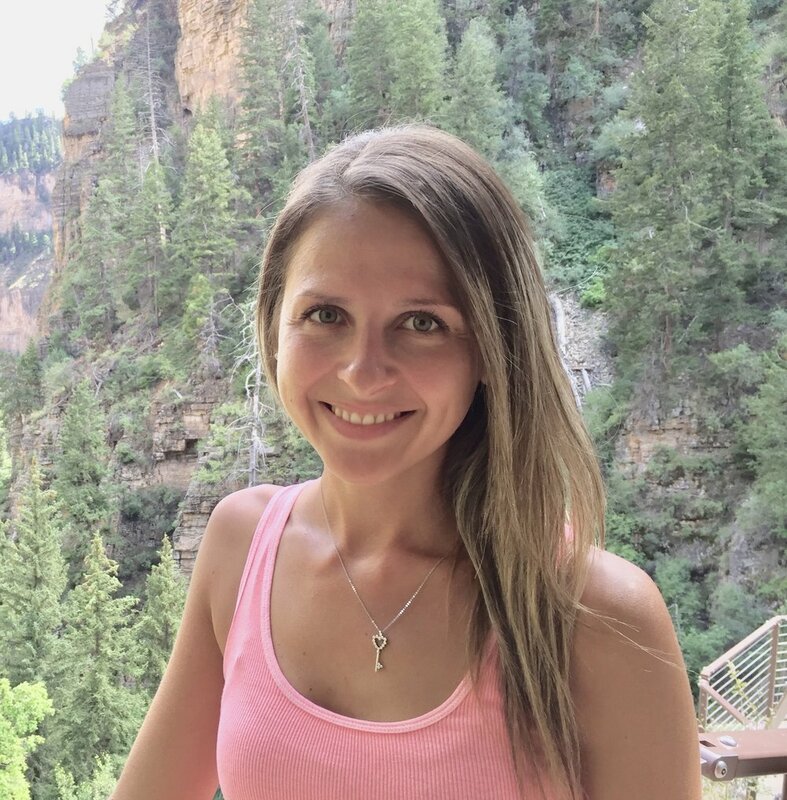 It’s wise to explore both lifestyle AND spiritual and emotional causes of a certain symptom so that you can get to the bottom of what’s really creating it. Many times when you heal the emotional aspect, the physical symptom naturally goes away. When out of nowhere your flight gets delayed, your interview gets cancelled, you get sick, etc., life might be trying to nudge you in a different direction. These things are usually beyond our control so it’s best not to fight or resist it, but to accept it and take it as a sign. The universe might be doing damage control to reposition you on the right path. It can also be a sign that your energy is low vibrational and actually creating these setbacks, so you need to shift your energy and change your mindset to align with a higher vibration. There are times in life when it seems like everything is falling apart and just when you thought life couldn’t get worse, it does. Your car breaks down, your roof starts leaking, you lose your job, your kid gets in a fight, your partner breaks up with you, or someone you love dies. Often times when everything in our life falls apart, it’s an invitation to learn to let go and to learn to detach from the world of form. It’s an opportunity to awaken. It’s also a great opportunity to rethink and reevaluate how we have been living our lives, see what needs to change, and start fresh in a way that aligns with who we truly are. This is the opposite of everything falling apart, and here you’re feeling inspired, feeling good, you’re in the zone, opportunities are showing up left and right, your desires are manifesting, you’re feeling connected and aligned, things just work out somehow, and there’s a sense of flow in your life. This is a beautiful sign that you are aligned with your truth and that you’re on the right path. When you’re in a state of presence and you go within to connect with yourself, great wisdom gets unlocked. This opens the flood gates for Spirit to communicate with you so that you can receive signs, guidance, and answers. Word of advice; you should ESPECIALLY pay attention to any of the above signs if they keep happening over and over again within a short period of time, or if they keep showing up throughout your life. Persistence and repetition is a surefire way to tell that the universe is trying to tell you something! When these signs come to you, it’s important that you don’t overanalyze and overthink the sign or try to make sense of it logically. When you over investigate it, it stops being a sign. The universe expresses its intelligence in great simplicity; it’s only our minds and egos that try to know the why, the what and the when. So always trust your gut! The point is, Universal Spirit ALWAYS has your back. It’s here to guide you and give you answers. It’s here to protect you and support you. It’s here to remind you in every moment that you are not alone and that you DON’T HAVE TO WALK THIS PATH IN FEAR, DISCONNECTION, AND CONFUSION. The universe knows your needs BEFORE you know your needs. All you have to do is look out for the signs and TRUST that you are being guided and supported every step of the way. There is a divine order and timing to everything; trust in that. And lastly, don’t forget that YOU ARE Universal Spirit. It is the ESSENCE of who you are. So really, it’s your own self guiding yourself to where you're supposed to be. I hope these tips were helpful and feel free to leave a comment to let me know what you thought! Please SHARE this article so your friends can benefit as well! SUBSCRIBE FOR MORE ARTICLES TO GUIDE YOU ON YOUR PERSONAL GROWTH AND SPIRITUAL JOURNEY!